Beer 101 | Comer Distributing, Inc. Certainly, beer was one of the first beverages ever produced by humans. There are written records of beer from Ancient Egypt and Mesopotamia. Beer can even occur in nature, as some cereals containing certain sugars can spontaneously ferment due to airborne wild yeasts. 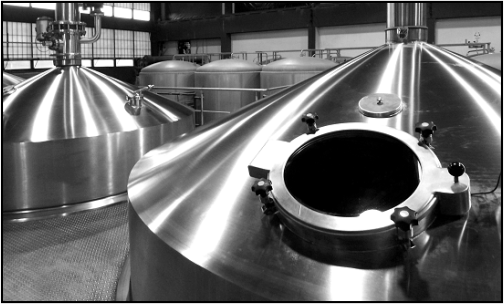 During the industrial revolution, the brewing of beer moved from being mostly an artisan process to an industrial one. Today, brewers large and small produce and sell over 35 billion gallons per year. There are only two main categories of beer – Ales and Lagers. All beers fit into one of the two. The difference between an ale and a lager starts with the yeast. Ale yeasts flocculate (form into small clumps or masses) at the top of the fermentation tank at a higher temperature than lager yeasts, which flocculate at the bottom. Ales and lagers are brewed differently as well. Ales are fermented at a higher temperature, around 40 – 55 degrees Fahrenheit, usually no more than a few weeks. Lagers ferment for much longer, typically months, at anywhere from 30 to 45 degrees Fahrenheit. Water accounts for over 90% of beer. The mineral content of the water can affect the final outcome of the brew and pure water supplies are in high demand for brewers. Barley is the primary cereal used as the source of carbohydrates for brewing beer. Although supplanted by wheat as a cereal for making bread in most of the world, it is really good for making beer. There are two major types of barley: two-row and six-row. Two-row barley is grown in the winter mostly, while six-row is usually grown in the spring. Barley must be malted before used in the brewing process. Hops are the ingredient in beer that provides its backbone of bitterness, increases its microbiological stability, helps stabilize its foam, and greatly influences its taste and aroma. The bitterness of hops helps balance the sweetness of the malt. This bitterness is measured on the International Bitterness Units scale, or IBUs. For example, a hoppy beer like New Belgium’s Ranger IPA has 70 IBUs, while a sweeter beer like Thomas Creek’s Stillwater Vanilla Cream Ale only has 23 IBUs. Yeast is the microorganism that is responsible for the fermentation in beer. Yeast transform wort, made by the brewer, into beer by metabolizing the sugars extracted from the malt and producing alcohol and carbon dioxide. Yeast also influences the flavor and character of the beer. Ale yeasts ferment at the top, while lager yeast ferment at the bottom. The brewing process is essentially converting the malted barley into wort and then fermenting the wort into beer using yeast. The process begins with mashing, which is mixing the malted barley with hot water. The mashing process takes one to two hours and the starches are converted to sugar. This sugary mix is called the wort. The sweet wort is then drained and separated from the grains and is put into a kettle, or copper, and boiled to remove the water and leave the sugars and other components of the wort behind. Hops are added during boiling as a source of bitterness. The longer hops are boiled, the more bitterness they contribute, but the less hop flavor and aroma remains in the beer. The now hopped wort is then cooled and is put in the fermenter where yeast is added. Fermentation can take anywhere from a week to many months depending on the strength of the beer. During fermentation, any particles of the wort settle. After fermentation is complete, the yeast also settles, leaving the beer clear. After the beer is fermented, it is packaged into cans, bottles, or kegs and is ready for consumption. CraftBeer.com: Food pairings, recipes, beer education, and beer news and events. BeerAdvocate.com & RateBeer.com: Beer ratings and reviews by consumers. DraftMag.com: Recipes, reviews, beer guides, video reviews, and beer blogs. The Oxford Companion to Beer: Edited by Brooklyn Brewery’s brew master Garrett Oliver.